Pork tenderloin is wonderful when cooked properly. Follow our steps below to achieve your perfect tenderloin. And although pork loin and pork tenderloin sound the same they really are very different. The two loins are different because of the location in which the two sections are derived. 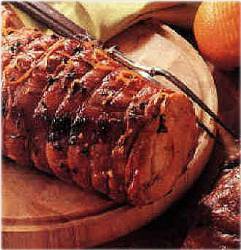 The pork loin which is sometimes called "the pork loin roast" is a larger section of the loin segment of the animal which is most often roasted. It usually comes in two forms either "bone in" in which the loin ribs are left attached, or the more commonly know "boneless" which you may have seen tied with butcher's string to prevent the loin from falling apart during cooking. This is most commonly the section in which pork rinds are cut and cooked. As for the tenderloin this section of meat comes primarily from the major muscle section along the central spine of the animal. This is undoubtedly the most tender portion of the animal because this section is used for posture and not for the high task of movement. Pork loin is lean and succulent and lives up to its name. It is a versatile meat that can be marinated, rubbed, smoked, baked or cooked in just about any other way you can determine. Because the meat is so lean the real issues toward cooking the meat revolve around cooking times and just how long one should actually cook the meat. In this case Knowledge is Power especially for cooking or roasting. Some of the most basic and best meals I've had involve a pork loin and pork tenderloin that has been generously seasoned using simple spices like Kosher Salt and Pepper then roasted to just the right temperature. It makes my mouth water just thinking about it. Now even though pork loin and pork tenderloin are derived from entirely different sections of the animal the cooking and roasting methods are somewhat similar. One of the best ways to grill pork loin is to rub it with an exceptional pork rub. Jake's Tri -Tip, Steak and Rib Rub is a phenomenal dry rub for pork ribs, pork loin and pork shoulder. Grilling can be done on a kettle grill like a Weber or aluminum grill with gas or radiant heat and so on. Best methods are to cook the pork tenderloin over indirect heat followed by spreading on some Jake's Award Winning BBQ sauce. 1. Select your Pork Loin. 2. Clean and Wash, patting dry afterward. 3. Season the Pork Loin with Jake's Tri-Tip, Steak and Rib Dry Rub. 4. Let rest for 1 hour in cool dry place (refrigerator). Remove and let rest for 10 minutes at room temperature before placing it on the grill. 5. Prepare your grill bringing the temperature to 325 degrees. 6. Oil the grill grates with Olive or similar oil. 7. Place the Pork Loin over the cooler section of the grill and place the top on the grill. 8. Ensure the top grill vents are open and the bottom vents are at least half way open. 9. Begin grilling until the temperature is between 145 - 160 USDA which is the range at which the US Department of Agriculture considers the meat to be fully cooked and out of the zone at which the meat is unsuitable for consumption. 10. Checking temperatures every 15 to 20 minutes will ensure that the meat is grilled to peak temperature. Keep in mind though that each time the lid is opened you may need to add 5 minutes to the grilling cycle to adjust for heat loss. Focus on a temperature check every 25 minutes once your grill is running at the perfect temperature. 11. Once the internal temperature reaches the safe range 145 - 160 degrees Fahrenheit, take it off the grill. Let it rest for 5-10 minutes so the juices redistribute throughout the meat. We've added our Grilled pork loin tenderloin Tenderloin Cooking chart below to help out. Along with your Pork Loin Tenderloin get Jake's Special Dry Rubs and BBQ Sauces at Discount prices at purchase: Use Code 1707200910 with any item and receive a 10% discount.